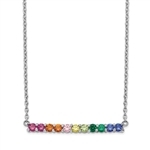 You can choose from spectacular necklaces designs beautified with Diamond Essence diamonds or simulated colored stones . 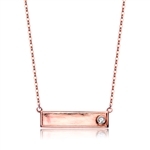 Delicate or structured, fine or opulent but most of all elegant the Diamond Essence necklaces can satisfy any taste. These dazzling simulated diamond necklaces are available in a huge variety of styles, colors, and precious metals. 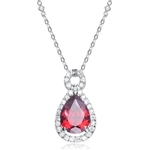 Diamond Essences guarantees all of its stones for life, and most of these extremely high-quality fake diamond necklaces are also covered by a 30-day money-back guarantee. Diamond Essence is committed to your satisfaction. Whether your purchase is a gift for someone special or for yourself, the enormous selection available from Diamond Essence ensures that something lovely is always available to fit every style. 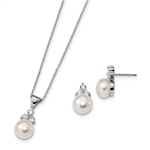 Aside from the radiant Diamond Essence simulated stone necklaces, which are similar but superior to cubic zirconia necklaces, Diamond Essence also offers luxurious pearl necklaces in many different designs. 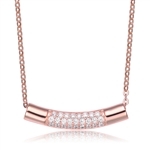 All of these beautiful Diamond Essence necklaces are very affordable, no matter what color, style, or carat total simulated diamond necklace catches your eye. 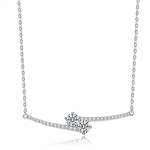 Need help selecting the perfect simulated diamond necklace? Give us a call toll free, at 1-800-909-2525 or email at info@diamondessence.com . Free & fast shipping available!